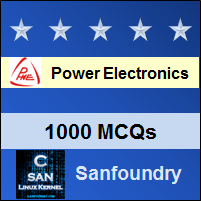 This set of Power Electronics Multiple Choice Questions & Answers (MCQs) focuses on “Single Phase FW AC-DC-1”. Explanation: It is a two pulse i.e full wave M-2 connection. Explanation: The bottom winding forward biases the SCR T2 at π, conduction starts after the pulse is given at α & stops when T2 is naturally commutated at 2π. 3. For a single pulse M-2 rectifier with RL load and firing angle α >0°, the value of the inductance L is such that the load current is continuous. Explanation: As mentioned, L is such that the load current is continuous. Hence, it never falls below a predefined positive value. Explanation: When T1 is gated, the other SCR T2 is reversed biased due to the windings so connected. Same can be said when T2 is gated and T2 is off. 6. Find the expression for the average value of the output voltage for the below given circuit. Consider the load current to be continuous, firing angle = α, transformer ration 1:1 and Vs = Vm sinωt. And the integral runs from α to α+π. Explanation: Fully controlled implys that all the elements are “fully controlled” hence, it uses SCRs only except the FD. Explanation: In R load both V and I are positive, in RL load the voltage can be negative but current is always positive. 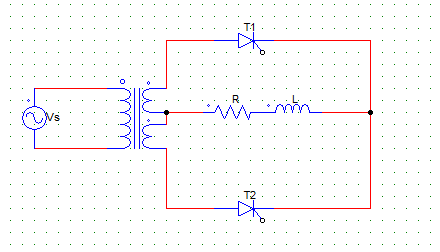 Explanation: 4 SCR’s are connected in a bridge fashion. Explanation: B-2 is the bridge type controller, in which 2 devices conduct at a time. One acting as the current supplying path and other acts as a return path.